Eckart-Werke Standard Bronzepulver Werke Carl Eckart Gmbh & Co.
1996-01-16 Application filed by Eckart-Werke Standard Bronzepulver Werke Carl Eckart Gmbh & Co. filed Critical Eckart-Werke Standard Bronzepulver Werke Carl Eckart Gmbh & Co. The invention relates to coloured aluminium pigments consisting of metal-oxide-coated aluminium platelet substrates in which the metal oxide coating contains colour pigments, a process for their production and their use as effect pigments. The invention relates to colored aluminum pigments, one AV lead for their preparation and their use. The effect pigments are commonly used are Aluminiu flakes and coated mica flakes, which show Aluminitimpigmente typical metal gloss, coated mica platelets typical pearlescence. In recent years, the demand for colored effect pigments has increased greatly. Therefore, oxide-coated copper and brass flakes, for example, coated with transition metal oxides substrates such as muscovite, phlogopite or glass, guanine crystals (pearl essence), BiOCl crystals, lamellar hematite crystals, platy phthalocyanines or comminuted thin multilayer films with Fabry-Perot structure as effect pigments used. In order to achieve color effects, aluminum pigments are, among other things mixed with transparent color pigments The coloristic possibilities are limited, however, so far with this method, as no interference effects can be achieved in this way have no pigments as pearlescent. Interference pigments with pearlescent, which are mostly based on coated mica flakes, however, because of their transparency poorer coverage than aluminum pigments. It has therefore attempted to produce, by coloring aluminum pigments pigments with good opacity of the aluminum flakes and the coloristic possibilities of the interference pigments. US-4,328,042 and EP-A-0033457 describe the manufac gold-colored aluminum pigments by precipitation of iron oxide, wherein iron pentacarbonyl is oxidized in an inert gas generated by fluidization with a fluidized bed of the aluminum flakes with oxygen. The disadvantage of this method is the very great technological effort. US 5,037,475 describes the production of aluminum pigments which are colored by fixing color pigments on the metal surface. The fixing of the pigments via carboxyl polymers. To improve adhesion, a protective layer may be applied by polymerization. However, the pigments so produced have a poor color intensity. WO 91/04293 (PCT / US90 / 05236) describes the coloring of aluminum pigments by fixation of the polymer coated pigments from aqueous solvents via electrostatic forces on the metal surfaces. The coating result depends in a complex way on type of aluminum pigment, the type of poly heritage coating of the color pigments, the solvent composition and the pH value. obtain titanium dioxide layer. compliance with specific conditions is crucial for the production of the coated pigments. The pH must be in the range of 4 to 8, and the dropwise addition rate when adding the titanate ester must be 2 metal surface in the range of 1.0 x 10 -7 to 1.0 x 10 "^ mole per minute and m. Therefore, this a method industrially not be used. in addition, the coated pigments must be calcined after drying to obtain color effects, since only by the removal of water from the metal oxide film a suitable layer structure. because of the low melting point of aluminum, however, the calcination is in coated aluminum pigments only very bad possible. Water vapor is converted in a whirling fluidized bed in the presence of hot aluminum particles. Also in this method, the complex technology is disadvantageous. In US-4,158,074 the production of colored aluminum pigments by coating with a film of hydrated alumina and hydrated metal oxide is disclosed. The film is formed by treating fine aluminum flakes in an alkaline solution of an iron, nickel, cobalt, zinc or copper salt at elevated temperature at pH 8 to 12, ie duch an electrochemical reaction of the metal salts. So let gold colored pigments, produced by the addition of chelating agents also dark brown and gray white pigments. In US-5,261,955 a sol-gel process is described for the preparation of colored metallic pigments, in which the metal flakes are dispersed in a sol of an inorganic salt, for example an aqueous alkaline zirconia sol, the coated with the sol platelets after filtration in a solution of an inorganic compound, for example cobalt nitrate, dispersed in an organic solvent, and is formed by heating a sol-gel layer on the platelets. By the plurality of individual steps, high equipment complexity is also necessary in this method. JP-A-61-130375 discloses a gold-colored aluminum pigment prepared by treating aluminum powder with dichromate, sodium fluoride and surface active agents in an acidic solution, drying and then treating with a fatty acid derivative. Other colors than gold can not be achieved with this method. DE-OS 41 40 295 describes pigments comprising platelet-shaped carrier materials, preferably mica, which are coated with an inorganic matrix, are included in the metal oxides and / or dye particles in the submicron range. The coating of the substrates takes place from acidic aqueous suspensions by hydrolysis of metal salts, preferably titanium tetrachloride, in the presence of metal oxide and / or dye particles. However, the coloring of aluminum flakes by this method is not possible because the aluminum particles decompose rapidly under these conditions. US-3,067,052 discloses colored aluminum pigments which are produced by the oxidation of aluminum powder with KMnO ^ solution, optionally with addition of a reducing agent. The color of these pigments is golden, possibly depending on the reducing agent with a greenish or reddish tone. From DE 25 57 796 a colored aluminum pigment is known which is coated with a carbon black as a coloring pigment contained metal oxide layer. The color pigment proportion of at most 10 wt .-%. According to this scripture sic larger amounts of color pigment adversely affect the shine un the color. DE 36 17 430 discloses coated colored pigments, wob is the base pigment of mica. Color pigment-containing coatings are not mentioned in this document. The color effects of the pigment described caused by interference. DE 42 23 383 describes metal sulfide-coated substrates, wherein the metal sulfide layer contains no color pigments. From DE 42 23 384 metal oxide coated Alumuiniumsubstrate without color pigment content are known. D for achieving good gloss effects, this document is zufol a lowest possible content of carbon, that is decisive of lubricants and organic impurities. The substrates therefore have to be pre-treated by heating an oxygen-containing atmosphere i.
JP-1-110568 (Patent Abstracts of Japan, section C, vol. 1 (1989) no. 331 (C-622) discloses coated with thin oxide layers Altiminium substrates without color pigment content, the color effects caused by interference. The process for the production of colored pigments on mica-based pigments no aluminum can be produced from the above reasons, where there is, however, due to the higher opacity and the metallic luster a lot of interest. However, the known processes for coloring aluminum pigments provide a few shades predominantly in the gold sector, and are mostly of apparatus much on Endig. still There was therefore a need for colored in various shades aluminum pigments and to an apparatus-simple method for the production of these colored aluminum pigments. The object of the invention is to provide such pigments and to a method for the production thereof. This object is achieved in that the aluminum pigments are provided, consisting of platelet-shaped aluminum substrates coated with a color-pigment-containing metal oxide layer. The pigments of the invention are prepared from platelet-shaped aluminum substrates by the metal oxide layer is not carried out by precipitation of the metal salts from aqueous solution, but by controlled hydrolysis of metal acid esters in the presence of pigments in an organic solvent by means of a process performed in a step sol-gel process. The aluminum pigments of the invention show a wide variety of colors, such as blue, red, purple and gold, and metallic luster. anreibt manner, b) mixing the dispersion processes with aluminum pigments and one or more organic solvents, c) one or adding more metal acid esters, d) fold 5 to 1 to the de complete hydrolysis of metal acid ester are added stoichiometrically required amount of water, e) after the end of reaction the volatiles were removed in conventional manner from the mixture and f) drying the resulting pigments. Aluminum pigments prior to performing step b) subjected to degreasing treatment. In a further preferred embodiment, a Te of the metal acid ester already in step a) during the Verreibens to the / the color pigments is added, and accordingly, in step c) reduces the amount of metal acid esters. In another embodiment, a conventional additive is added in step a), which improves the pigment dispersion. The invention relates to addition to the pigments themselves also ei process for their manufacture, comprising the aforementioned steps a) to f). In a further embodiment of the inventive method, the reaction mixture obtained in step d) is heated to a temperature between 40 ° C and the boiling point of the added in step b) the solvent and / or a basic catalyst is added. The drying in step f) is preferably carried out at less than 200 ° C, more preferably less than 150 ° C, and most preferably at less than 100 ° C in vacuum, for example at 90 ° C in a vacuum drying cabinet. 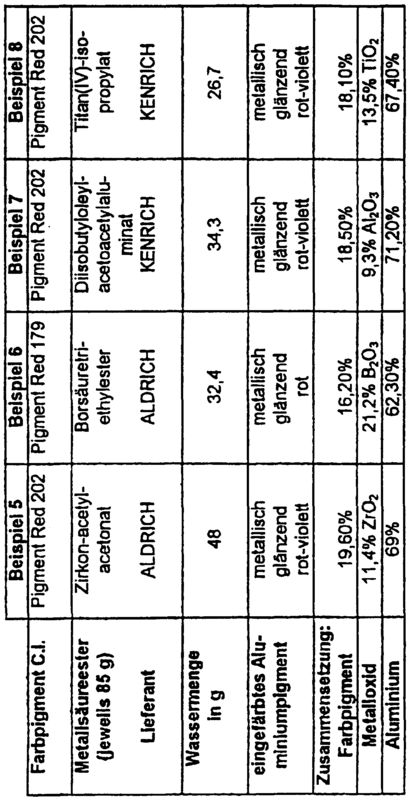 Industrial Organic Pigments, VCH-Verlag, Weinheim, 1987) and geared to the manufacturer's recommendations. Preferred color pigments are CI Pigment Blue 15: 3, CI Pigment Red 179, CI Pigment Red 101 and CI Pigment Red 202. It may be used a single grade of pigment or a mixture of several types of pigment, depending on the desired color tone of the aluminum pigment of the invention. Series (Fa. Eckart). These silver dollars allow particularly brilliant colorations because of their low stray share. Solvent in question, preferably water-miscible solvents. Particularly preferred alcohols are such as methanol, ethanol, n-propanol, i-propanol, n-butanol, i-butanol and t-butanol, most preferably i-propanol. It is also possible, as required according to step d) of the process before the end of reaction again an additional amount of the solvent used in step b) is generally required. The total amount of solvent added is preferably 150 to 300 ml per 100 g aluminum substrate. Diisopropyloleylacetoacetylacetonat. In addition, mixtures of metal acid esters of various metals can be used, which can also be fused partly, for example Dynasil R (Fa. Huls), a mixed Al-Si metal acid ester. It will be based on 100 g of aluminum substrate having a surface area of about 4 m 2 / g (BET) 15 to 40 g of color pigment, preferably 20 to 40 g, and 0.1 to 0.8 mol of metal acid esters, preferably 0.5 mol, used. When using more than 0.8 mole of metal acid ester m a colored aluminum pigment with poor gloss and di pigments tend to receive unwanted agglomeration. When using less than 0.1 mol of metal acid ester rich not the stability of the coated pigment to water un acids and it can not achieve sufficient adhesion of the color pigments to the aluminum pigments. Using less color pigment than 15 g, we achieved no sufficient color effect in Verwendu of more than 40 g of color pigment of the metallic luster of the aluminum pigments is excessively covered. Decisive for the inventive method, the step i d) is used amount of water is 1 to 5 times the time necessary for complete hydrolysis of the metal acid ester amount. A larger excess water can lead to graying of the aluminum pigments and should therefore be avoided. Relative to 1 mol of a tetravalent metal acid ester, for example an ortho-silicate, titanate od zirconate, 4 to 20 mol of water are therefore used, preferably 4.5 to 10 mol. Relative to 1 mol of a trivalent metal acid ester, for example a borate or aluminate, are used in accordance with 3 to 15 moles of water, preferably from 3.1 to 8 mol. demineralized water is preferably used. Metal acid ester and is adjusted as needed. Particularly when using silicic acid esters, the addition of basic catalysts is preferable, which can be added in step d). It can be used customary basic catalysts. Suitable bases are amines such as triethylamine, tributylamine or ethylene diamine or substituted amines such as dimethylethanolamine or methoxypropylamine. Moreover, it is also possible to add autocatalytically acting aminosilanes such as 3-aminopropyltrimethoxysilane, N-aminoethyl-3- aminopropyltrimethoxysilane, or 3,4,5-dihydroimidazol-l-yl-propyltriethoxysilane. If necessary, a further addition of base can again take place after some time. After completion of the reaction, ie usually in 0.5 to 10 hours, the volatiles are removed in conventional manner from the reaction mixture, for example by distillation or by pressing. The pigments are then dried, for example in a vacuum drying cabinet. The colored aluminum pigments can be further processed as customary aluminum pigments. For example, it is advantageous for many applications to produce by the addition of solvents such as hydrocarbons, ethyl acetate, methoxypropanol or butyl glycol, non-dusting pastes. to protect aluminum pigment from moisture and chemicals. The colored aluminum pigment according to the invention are therefore for example can be used both in conventional solvent-based paints and in water-based paints. The new, colored aluminum pigments of the invention have a particularly great brilliance and a wide range of possible colors. The pigments are very stable. The process is simple and carry out a large scale and does not require expensive equipment Calcination of the pigments is not necessary because the pigments of the invention show after drying, excellent brilliance, color intensity and stability. The pigments of the invention can advantageously be used to effect at in paints, coatings, plastics, printing inks and cosmetic preparations. 30 g of CI Pigment Blue 15: 3 are dispersed with 85 g of silicic acid (from Wacker.) Using 300 g of zirconia beads (0.7 mm diameter) in a media mill (Red Devil, from Union NJUSA.) And ground. To this dispersion are added at room temperature, 100 g of aluminum pigment (Stapa Metallux 2154 BET surface area 3.8 m 2 / g, Fa. Eckart) and 208 ml of isopropanol and the mixture is stirred for one hour. Are then added to a solution of 0.78 g of ethylenediamine and 51.4 g of deionized water and the suspension was heated with stirring to 80 ° C. At intervals of one hour or twice per 0.78 g of ethylenediamine and 51.4 g of isopropanol are added. The mixture is heated for a total period of 6 hours. The product is then filtered and dried at 90 ° C in a vacuum cabinet. This gives a metallic luster, intense blue aluminum pigment. 20 g of CI Pigment Red 179 are with 56.7 g of silicic acid, 23.3 g of white spirit and 11,4 g of a wetting and dispersing additive (Anti Terra U 80, Byk-Chemie) according to the procedure of Example 1 ground. To the mixture, 100 g of aluminum pigment (Stapa Metallux 2154) and 208 ml of isopropanol are added. After 0.5 hours of stirring at room temperature 28.3 g of silicic acid are added. After a further 0.5 hours, a solution of 0.78 g of ethylenediamine and 51.4 g of demineralized water is added and heated to 80 ° C. At intervals of 1 hour twice or 0.78 g each of ethylenediamine and 51.4 g of isopropanol are added. After 6 stündigera heating the mixture is filtered and dried at 90 ° C in a vacuum cabinet. This gives a shiny metallic dark red aluminum pigment. 51.4 g of deionized water at 80 ° C heated. After two hours, 0.78 g of ethylenediamine and 51.4 g of isopropanol are added. After 6 hours of heating, the mixture is filtered and dried at 90 ° C in a vacuum cabinet. , A blue, shiny metallic aluminum pigment. 40 g of CI Pigment Red 101 are milled in 90 g of isopropanol as in Example. 1 The further procedure corresponds to that of Example 3. The aluminum pigment STAPA Metallux 8154 is used by the applicant. This gives a shiny metallic, golden aluminum pigment. In Examples 5 to 8, the dispersion of the respective color pigment according to Example 3. The coloring is carried out is also carried out as in Example 3 with those in Table 1, metal acid esters and the quantities of water listed in Table 1. 1. Colored aluminum pigments comprising platelet-shaped, coated with a metal oxide of aluminum substrates, characterized in that the metal oxide pigments in an amount of 15 to 40.%, Based on the aluminum containing substrate. 2. Colored aluminum pigments according to Claim 1, characterized in that the amount of metal oxide 3 to 95 wt.%, Based on the aluminum substrate. 3. Colored aluminum pigments according to claim 1, characterized in that the color pigment content of the metal oxide is present in at least 20.% Based on the aluminum substrate is. Colored aluminum pigments according to Claim 2 or 3, characterized in that it is in the color pigments are organic color pigments. 5. Colored aluminum pigments according to one of claims 1 to 4, dadurcherh ä ltlich that one anreibt one or more color pigment types in the usual way a), b) mixing the dispersion processes with aluminum pigments and one or more organic solvents, c) one or more Metallsäureester added, d) adding from 1 to 5 times the stoichiometrically necessary for complete hydrolysis of the Metallsäureester amount of water, e) the volatiles removed in conventional manner after end of the reaction from the mixture and f) drying the resulting pigments. 6. Colored aluminum pigments according to claim 5, dadurcherh ä ltlich that the aluminum pigments no degreasing treatment were subjected to prior to performing step b). 7. Aluminum pigments according to claim 5 or 6, dadurcherh ä ltlich that is added on trituration the color pigments in step a) a portion of the total amount of Metallsäureester and then) to f) performing steps b, wherein) less Metallsäureester appropriately added in step c becomes. 8. Aluminum pigments according to one of claims 5 to 7, dadurcherh ä ltlich in that in step a) an additive for improving pigment dispersion is added. 15 to 40 g of color pigment and are used a total of 0.1 to 0.8 mol Metallsäureester. 10. Aluminum pigments according to one or more of claims 5 to 9, dadurcherh ä ltlich that the / the Metallsäureester from alkyl alcoholates, Arylalkoholate, carboxylates, with carboxyl residues or alkyl residues or aryl-substituted alcoholates or carboxylates of titanium, zirconium, vanadium, silicon, aluminum and boron, or mixed condensed Metallsäureester these metals is / are selected comprehensive group. is / are selected aluminum acetylacetonate, titanium acetylacetonate, zirconium acetylacetonate, Diisobutyloleylacetoacetylaluminat, Diisopropyloleylacetoacetylacetonat or mixed Si-Al-Metallsäureester group comprising. 12. Aluminum pigments according to one or more of claims 5 to 11, dadurcherh ä ltlich that heating the reaction mixture obtained in step d) to a temperature of 40 ° C to the boiling point of the solvent and / or adding a basic catalyst, and then the steps of e) and f) is carried out. 13. Aluminum pigments according to one or more of claims 5 to 12, dadurcherh ä ltlich that is dried in step f) at less than 200 ° C.
15. Use of the aluminum pigments according to one or more of claims 1 to 14 as effect pigments in paints, coatings, printing inks, plastics and cosmetic preparations. MX341762B (en) * 2012-04-19 2016-09-02 Basf Se Process for preparing an effect pigment.